NFL on Ice? Well, quite yes 🙂 Sunday was one of the coldest, wettest days on record for NFL football games. Throughout the north lands gridirons were filling up with snow and ice while waiting for the players and fans to arrive. It was 2 degrees at Lambeau Stadium that morning and not much warmer elsewhere. There was 8 inches of snow on the ground at Philadelphia when the Detroit Lions arrived in town to take on the Eagles. 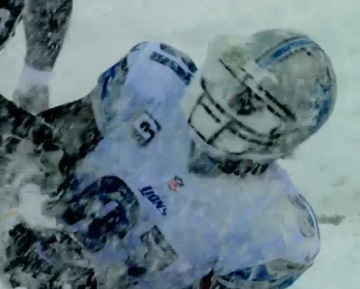 Now it’s cold up in Detroit as well, but the Lions are a dome team and these were definitely not dome conditions. As the game got underway, it was pointed out by the commentators down on the field that the players could just barely make out the figures over on the sidelines and sending in signals that way was simply impossible. The Eagles went into the game as 2.5 point favorites with the Over & Under set at 51.5. Under bettors rejoiced when they saw all that snow as 51.5 points seemed like too high a goal under those inclement conditions. At halftime the score was 8-0 Lions and Under bettors were starting to celebrate, just a little. But the Eagles finally got on track in the fourth quarter and scored 28 points on 3 rushing touchdowns from LeSean McCoy, Chris Polk and Nick Foles plus one TD pass from Foles to DeSean Jackson to pull away from the Lions and actually bring the final score up to 34-20, three and one half points over the total! About the last team that we would expect to do well up in the snow and cold would be the Miami Dolphins. Before the game we saw Dolphin players arriving on the field starring in fascination at the white field. Some of them had never seen snow before in their entire lives, except on TV. Big Ben Roethlisberger and the Pittsburg Steelers hosted the Dolphins as 3 point favorites but, once Miami got used to the cold, the Steelers were not that much of a problem. Daniel Thomas sped 105 yards for a score then had another 55 yard zigzag run that set up the winning score in the fourth quarter. Perhaps the handicappers had figured the snow would slow down the scoring a bit. At any rate, the Over & Under for the game was just 40.5 and was exceeded before the close of the third quarter. Final score: Dolphins 34-Steelers 28.